American crystal fashion trends changed from brilliant cut glass at the turn of the 20th century to fine blown glass with etchings. Brilliant cut glass required a thick heavy style, but etching worked on thin crystal blanks. Etched crystal had 50 years of popularity. Elegant patterns from the first half of the 20th century are available in shops, at shows and online. Patterns originally had names or numbers for identification, but removal of labels and a change of ownership leave these patterns unidentified. Feel the design to be sure it is an etched pattern. Etching feels rough. Many styles of etching were in use, including needle etching, sand etching and wheel etching. Etching removes tiny particles of glass to form the design. Non-etched designs may be enamel on the surface or pattern glass pressed in a mold if they do not feel rough to the touch. Turn the crystal over and hold it to the light. Look for a name acid etched on the bottom. Fostoria, Gorham, Libbey and Lenox often mark their crystal; so do English makers like Stuart, and French makers like Lalique and St. Louis. Identifying the company is half the challenge; the other half is identifying the etched pattern. A name on the bottom identifies the maker so you can narrow your search for patterns only by that maker. 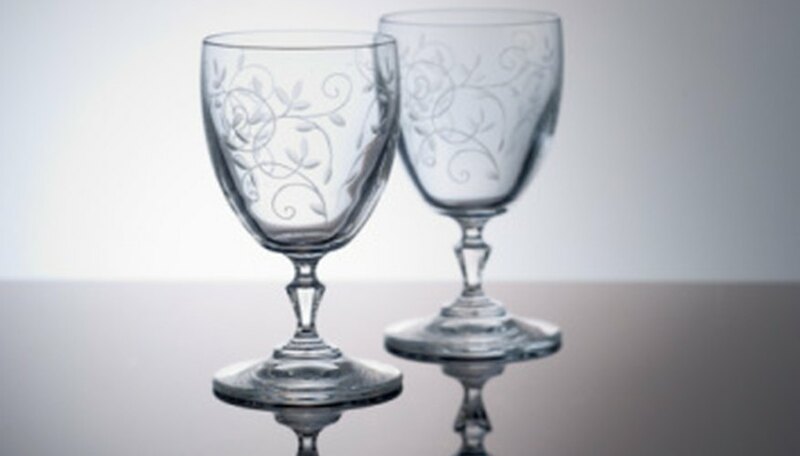 Compare your etched crystal with the most popular etched crystal patterns from the Replacements, Ltd. website or “Stemware of the 20th Century: The Top 200 Patterns” by Harry Rinker to find your pattern. Another excellent source is “Crystal Stemware: Identification Guide” by Bob Page and Dale Frederiksen. If your pattern is not in the popular patterns, the challenge increases. Identify the flower, if your etching is a flower design. Heisey was famous for the orchid pattern. Thistle etching is usually Central Glass. Glastonbury-Lotus decorated Duncan Miller stems with buttercup etchings, and Fostoria made a buttercup etching as well. Fuchsia, heather and chintz were Fostoria flower etchings. Look for the etched crystal by flower name at your public library in glass or crystal books in the antiques and collectibles section. Make a scan or picture of your etched crystal and send it to the research department of Replacements, Ltd. for identification. Alternatively, carry it with you to antiques shops or collectibles shows and ask dealers for help. Many knowledgeable and helpful dealers participate in shows or own shops. If you believe your crystal item is of recent production and an import, visit fine department stores to see if you can identify it.